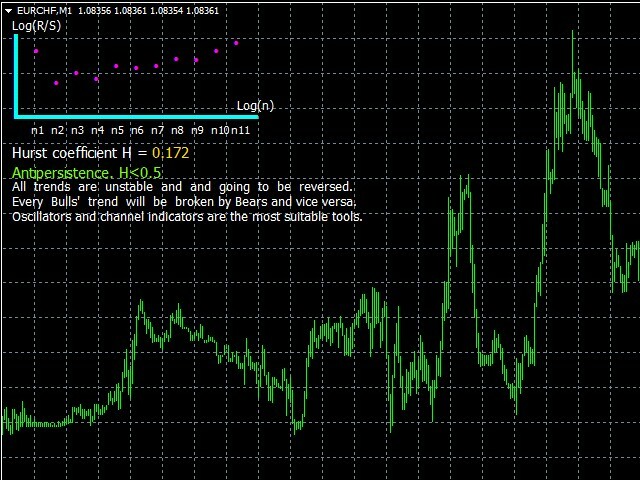 "Hurst index" is the analyzer of the the selected currency pair market fractal structure by using the R/S-analysis. The analyzer determines, by calculating Hurst index, whether the market tends to keep the trend (persistence), or direction in the past most likely will be replaced by the opposite direction in the future (antipersistence). The Hurst exponent is used as a measure of long-term memory of time series. Studies involving the Hurst exponent were originally developed in hydrology for the practical matter of determining optimum dam sizing for the Nile river's volatile rain and drought conditions that had been observed over a long period of time. Benoît Mandelbrot believes the same effect can be generalized on Financial markets. If the Hurst index ranges from 0.5 to 1, the process must be characterized by long-term memory. In other words, there is persistence. 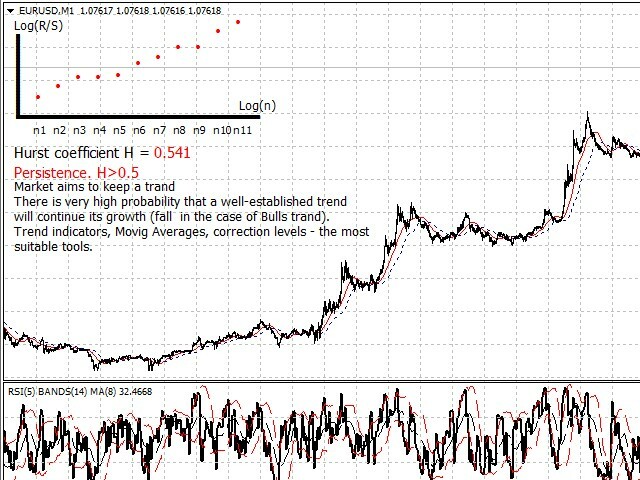 If the Hurst index ranges from 0 to 0.5, the process must be characterized by antipersistence. For example, second-tier stocks. If new bar have formed analizer recalculate coefficient. OffsetX - set the ofset of the analyzer graph on the program main window relative to the horizontal axis. Remember: the "zero point" is the upper-left corner of the window. OffsetY - set the ofset of the analyzer graph on the program main window relative to the vertical axis. 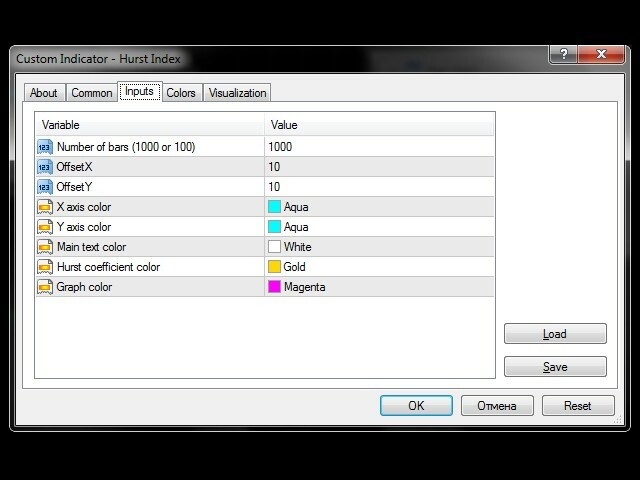 SetHurstColor - numeric value of Hurst index color. SetGraphColor - the graph points color. (!) It is highly recommended to use default values. Hurst index will help you adjust your trading strategy and it doesn't matter whether you are long-term, medium-term or short-term investor in the Forex market. If the market is persistent it means that market aims to keep the trand. There is very high probability that a well-established trend will continue its growth (fall in the case of Bulls trand). The higher value of the Hurst index (H) means stronger the market's ability to persistence. 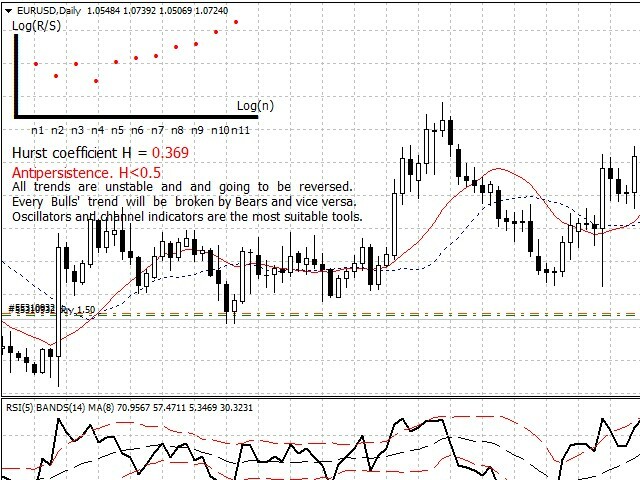 Trend indicators, Movig Averages, correction levels - the most suitable tools. If the market is antipersistent each trend is unstable and and tendency is going to be reversed. Every Bulls' trend will be broken by Bears and vice versa. The lower value of the Hurst index (H) means the stronger market's ability to antipersistence. Oscillators and channel indicators are the most suitable tools.